This month, 350 years ago, an event occurred that changed India. In April 1662, England’s King Charles II took possession of Bombay, given to him as dowry. Though the Portuguese lied to him earlier and had promised everything up to Borivali, Charles II was given Bombay from Colaba to Mahim. I believe this event, more than any other, and the thinking of a small group of Indians, more than any other, led to British rule in India. Let’s see how. The traditional narrative of the British capture of India focuses on the east rather than the west. 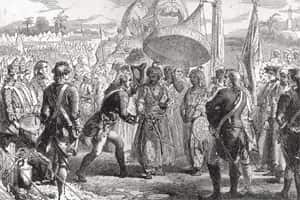 It runs like this: Enraged by the Black Hole incident, Robert Clive bribed Mir Jafar to betray Siraj ud Daulah, the governor of Bengal, Bihar and Orissa. At Plassey in 1757, a small force of Britishers and sepoys defeated the governor’s army and installed a puppet. Britons took the revenue collection (diwani) rights of Bengal, Bihar, Orissa from the weak Mughal emperor in Delhi after the Battle of Buxar. From here they expanded till 1857, when they took Delhi. Let’s look at the east first. What exactly happened before the Battle of Plassey? Sir Penderel Moon (The British Conquest and Dominion of India) says “some influential Hindu bankers in Murshidabad, alienated by Siraj ud Daulah’s violence and caprice, had secretly informed (the British) that they were meditating his removal". These influential bankers were Oswal Jains, led by a man whose title was Jagat Seth, meaning “banker to the world". His name is not known for certain, but it might have been Madhav Rai. The Muslims had no confidence in running the economy and usually trusted the Hindu mercantile castes to do this. Akbar’s economist Todar Mal was Punjabi Khatri. The problem the Oswal Jains had with Siraj ud Daulah was that, only in his 20s, he was not mature or knowledgeable. He did not understand interest or finance, and did not apply the rule of law. He preferred rule by whim. He became violent when it was learnt that he had no money to pay salaries to the army. Sir Penderel writes: “He is said to have struck Jagat Seth, the leading Hindu banker, in the face and threatened him with circumcision... It seems to have been Jagat Seth who took the lead in approaching the English for help in overthrowing him." Jagat Seth played from the shadows. History records the broker of Plassey’s treachery as another trader in Bengal, a Punjabi Khatri called Amin Chand. He is said to have cemented the deal between Clive and Mir Jafar, but then blackmailed the British saying he would tell Siraj ud Daulah unless he was paid ₹ 30 lakh. Clive went along, but duped him with a fake signature on their agreement, and Amin Chand is said to have fainted in shock on finding out. But later books show that Amin Chand was back in British favour and doing business with them. This does not strike me as being normal. My speculation is that Amin Chand was unimportant to Plassey, and the main character was Jagat Seth. Jagat Seth ran the economy for Siraj ud Daulah, Mir Jafar, and later for Mir Qasim. It is recorded that ₹ 3 out of ₹ 4 collected as revenue in the state went straight to Jagat Seth, against loans he had already advanced to the nawabs. After Mir Jafar refused to fight at Plassey and Siraj ud Daulah was defeated, Jagat Seth was the person who crafted the terms on which Clive and other officers took their payback. Mir Jafar had promised the British £2 million, or around ₹ 16 crore now (as damages in war) to instal him but the treasury only had £1.3 million. Jagat Seth decided how and when the balance would be paid in instalments. Most importantly, it was Jagat Seth who went to Delhi to convince the Mughal emperor to accept the English victory and instal Mir Jafar as nawab. He was clearly a man of enormous reach and influence with the Mughals. So why did he keep going out of his way to help Clive and the British? It is because he had done business with them. The newly founded city of Calcutta, which was under British control, was where the Jain and Hindu baniyaskept their money and papers. They trusted the rule of law that the British brought to their possessions. They knew from their fellow baniyasin the west how carefully the British managed trade in their new city of Bombay. They observed the fact that the British risked life to make sure that a violation on their sovereignty, such as the Black Hole incident, was punished. Jagat Seth’s next move was to soften his support to Mir Jafar and his successor, Mir Qasim, leading to a shortage in finances. With the economy unmanageable and the army unpaid, the path was open for Clive to seize Bengal, Bihar and Orissa. For this, Jagat Seth paid the price, and two of his family members were killed by a desperate Mir Qasim. Their bodies were fed to animals, by Qasim’s mercenary Soomro (a butcher from Strasbourg whose name was Reinhardt). But Jagat Seth ultimately won. Murshidabad lost its glory and power moved to British Calcutta. Now let’s look at the west. The English set up a warehouse (what they referred to as “factory") in Surat, where they stocked the items they were allowed to trade with India by Jahangir in the early 17th century. In 1617, Sir Thomas Roe declared Surat was the “fountainhead and life of all the East India trade". B.G. Gokhale writes (Surat in the 17th Century) that Surat was “perhaps the only great city of its time in India where the humble, submissive and much maligned baniya broker was the hero, the creator of its values". Surat’s Mughal governorship was a post that was bid for. The man promising highest revenue to Delhi got it. To secure this money and make his own, he would squeeze the Hindu and Jain merchants. The leading merchant of this period was Virji Vora, a Sthanakvasi Jain. Like Jagat Seth, Vora funded British trade. Like Jagat Seth, Vora was not fond of Mughal rule. In 1638, Shah Jahan fired Surat’s governor Masih uz Zaman for wrongly jailing Vora, after the angry baniyasprotested. During Aurangzeb’s reign, Shivaji looted Surat twice. First he came in 1664, sending a letter demanding that governor Inayat Khan and Virji Vora come out to meet him, else he would burn the city. Khan shut himself in the fort, refusing to defend Surat, and Shivaji came, looting ₹ 1 crore from merchants, including Virji Vora, and burning Surat down. He returned in 1670. Again the Mughals were unable to protect the merchant citizens from loot. Both times, only the British factory kept the Marathas out, with sepoys expertly shooting their rifles from its rooftops. Vora and the baniyaswould have noted this. In 1669, Surat’s qazi had ordered the baniyasto convert to Islam, according to John F. Richards (The Mughal Empire). The qazi forcibly converted and circumcised a baniyaworking as an accountant. The man killed himself in shame. Surat’s 8,000 baniyasabandoned the city in protest, travelling to Bharuch and leaving their wives and children with their next of kin, according to Sushil Chaudhary (The Surat Crisis of 1669). Vora died soon after. Richards, who has written the Cambridge history on the subject, thinks Vora was a Dawoodi Bohra. But this cannot be the case, as a letter published by Makrand Mehta (Indian Merchants and Entrepreneurs in Historical Perspective) shows. After Vora’s death, the most influential baniyawas a Hindu, Bhimji Parikh, who moved to Bombay to set up its first printing press. In 1672, the French East India Company’s Abbe Carre wrote in his The Travels of the Abbe Carre in India and the Near East From 1672 to 1674: “...many Hindus and their families were leaving the town to avoid (the Mughal governor’s) extortions and from fear of another attack by King Shivaji." The baniyaswent to Gerald Aungier (later to become governor of Bombay) for asylum from the Mughals. In 1679, Aurangzeb imposed jaziya, the property tax on non-Muslims, but by then the baniyashad already made up their mind. Jain and Hindu baniyaswere united on this. In 1672, only 10 years after Charles II got Bombay, Aungier was already farming out free land and trading rights to Surat’s merchants, flocking to the city. Surat’s decline and Bombay’s rise came in the west, mirroring the decline and rise in the east. Perhaps this story is not as clean as historians would want history to be. For instance, Surat’s subsequent decline was slow rather than precipitous. Other reasons exist for Bombay’s rise than the migration by baniyas, but the sequence is revealing. I am writing a play on Plassey that carries this background. And what drama there is in this story. All the bribing in Bengal, which for the Indian was second nature, could not have been swallowed as cleanly by the English. Clive killed himself in England, stabbing his throat repeatedly with a penknife, according to Burton Stein. He was condemned for taking £234,000 of the company’s plunder. He was honoured for setting up British rule in India. But my belief is that without the baniya’senthusiasm, the British could not have had their Raj.